This work by Asha Lightbearer is licensed under a Creative Commons Attribution-NonCommercial-ShareAlike 4.0 International License. Permissions beyond the scope of this license are available upon request. Request Licensing. 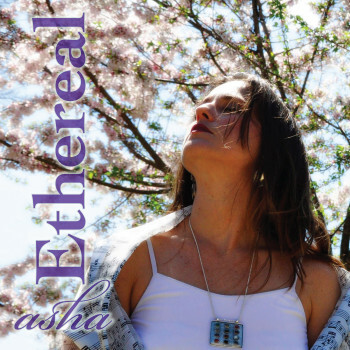 Ethereal was released in April of 2011 as a precursor to my first full-length album that I was working on for release the following year. It was inspired by a beautiful window at Veterans’ Memorial in Columbus, Ohio. I had been at the Universal Lightworkers Expo that year and found myself in a room with a wall of glass windows covered with a series of square spirals that made a beautiful pattern both in the window itself and the light that shone into the space. Combine this with all of the wonderful energy of the day and the amazing natural resonance of a large open room unadulterated by the buzz and mayhem of busy people, and voila… a perfect moment for singing, alone and untouched by anyone or anything else–just me and the light and the sound of my voice. In that surreal moment, out came “Hallelujah”, today known as “Ethereal”. To remain true to the theme of the U.L.E. weekend where this song was born, Ethereal was produced with the specific intention for healing. Before being released to the general public, the track was infused with a triple-layer energy treatment of light, breathe and sound to help listeners relax, release and let go. The idea was that merely listening repeatedly would help to clear stagnant energy patterns in the body and auric field, helping listeners feel better and improve their lives. To try on the energy healing treatment for yourself, listen to Ethereal at least seven times. You may not even like the sound of the song itself, but that’s OK. Do it anyway and notice how you feel each pass through as you listen. And if at first, you are more annoyed than feeling better, that’s OK too. Sometimes that’s part of the process of stirring up old stuff that can be released. To further enhance the experience, sit quietly and fully in your seat. As you listen, breathe deeply and exhale down deep into the earth. Imagine and allow light to shine on you, surround you and perhaps even fill your body and energize you. Enjoy! The first time I listened to Ethereal I cried my eyes out. The second time I felt warmth and love. The next day, I listened five times and then felt this huge surge of energy and purpose and a feeling of pure love. I feel like I have been shot out of an energy cannon! Thank you.